August 2nd, 1951. Seattle’s Seafair summer festival was just getting underway. It was the first day of Gold Cup races on Lake Washington. But a slower boat, the USS Gen. M. C. Meigs was urged to even greater speeds over on Elliott Bay. 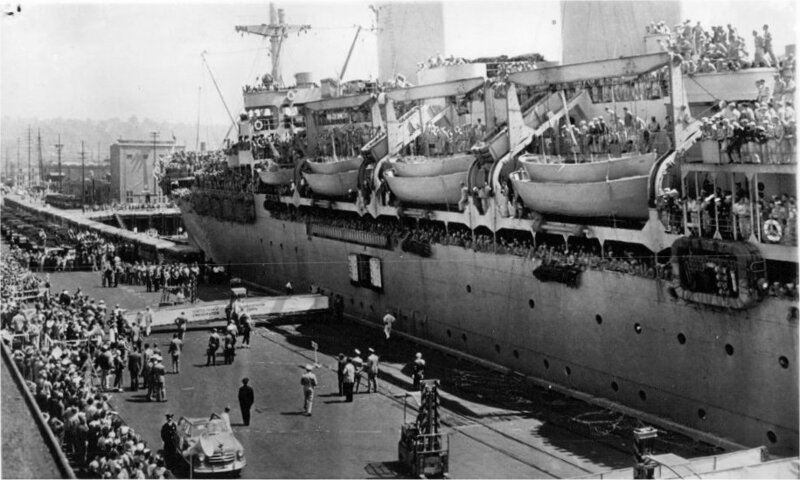 It was ferrying 4737 veterans back from their one-year tour in the Korean War. Here are 7 snapshots by an unnamed soldier of the ship’s arrival that I recently acquired. They show the ship arriving in Elliott Bay and pulling up to Pier 39 at the Port of Embarkation, just north of the Coast Guard pier today. I follow the photographs with a few moving accounts from the day’s Seattle Times, and a wire photo of the soldiers clamoring to disembark. Korean War Vets "Fireboat welcome", Seattle, 1951 (1 of 7). View full sized on Flickr. Korean War Vets "Fireboat Welcome", Seattle, 1951 (2 of 7). View full sized on Flickr. Korean War Vets, Seattle, 1951 (3 of 7). View full sized on Flickr. Korean War Vets "Welcoming Committee", Seattle, 1951 (4 of 7). View full sized on Flickr. Korean War Vets, Seattle, 1951 (5 of 7). View full sized on Flickr. Korean War Vets "Dock at Seattle", Seattle, 1951 (6 of 7). View full sized on Flickr. Korean War Vets "Pier", Seattle, 1951 (7 of 7). View full sized on Flickr. 19 Seattle residents were aboard, including Garfield High graduate Sgt Fujio Suhara. Lieutenant John O’Neal sensed the looming reunion with his wife and two children at their Wallingford home. Seattle Mayor William Devin greeted the Washington vets, and he was joined by St. Paul Mayor Edward Delaney who greeted vets from Minnesota. The welcoming committee had a surprise for one lucky soldier. 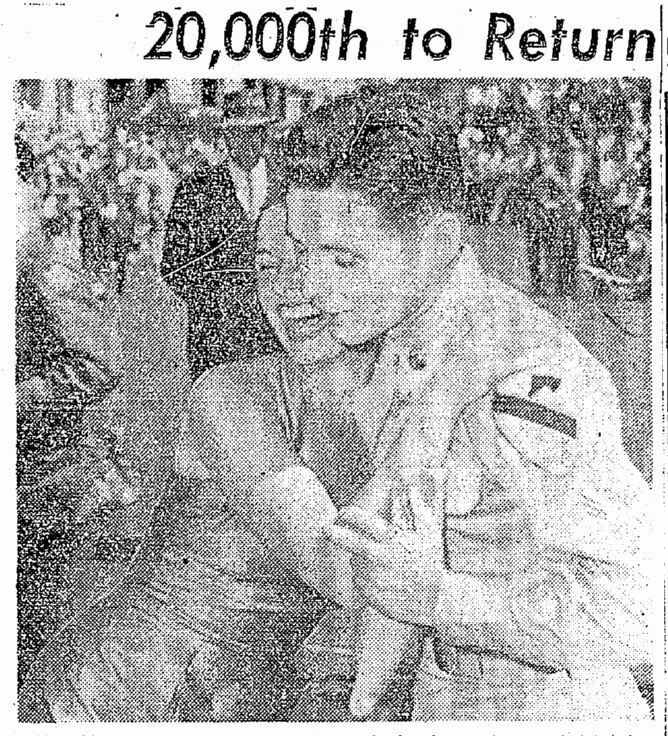 Sgt Michael P. Moore of New York was the 20,000th soldier to step onto Seattle soil from the Korean War. He had spent ten and a half months in Korea. He walked down the gang plank into the arms of Yolande Betbeze, Miss America. In the photo it looks as if his heart has stopped. Next in line was Darlene Shaffer, Miss Washington. A great photo of the USS Gen M. C. Meigs is floating around the Internet, shared below. It’s credited to the AP with the erroneous date of August 7, 1951. This is clearly 2 o’clock pm on Aug 2, 1951. The gang plank was raised at 2:05. Afterwards they were led in a parade up Second Avenue and on to Fort Lawton. An estimated crowd of 30,000 showered them with ticker-tape, confetti and flowers. The Seattle Times added that they were “stimulated by kisses thrown by pretty girls.” Women from Seattle Trust & Savings Bank gave flowers to soldiers in each passing truck and bus. 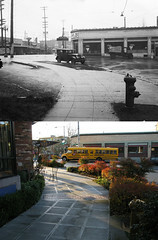 * Next, find out where Seattle’s killed and missing were from in Mapping Seattle and the Forgotten War. * Then, read about a man who probably doesn’t belong on Washington’s memorial to fallen soldiers of the Korean War.